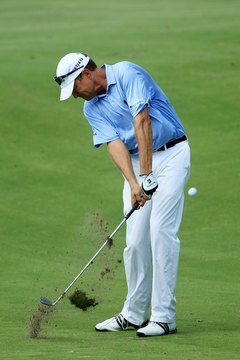 When pros have to play a shot from an old divot, they really go down after it, as David Love III does. A divot is the hole left when a golfer hits a ball off the turf. The player should have replaced the turf before moving on to his next shot. But that doesn't always happen, so it's not unusual for another player to find that his ball has come to rest in that divot. Hitting your ball out of a divot usually isn't all that difficult. But most players have to do it a few times before they feel comfortable with the shot. Assess the nature of the lie. All lies in a divot are not the same. If the ball is near the back edge of the divot, your primary concern is just getting the ball out; if the ball is near the front edge of the divot, you have more options -- especially if the divot is shallow. In either case, you'll need to make sure your club has enough loft to get the ball over the front edge. Choose the golf club you intend to use based on the lie. Unless you're close to the green, you probably won't be close enough to hit the club you normally use from this distance. Remember, especially if the ball is in the back of the divot, you must use a club with enough loft to make sure the ball gets out. Because you won't hit the ball as far with this club, choose one that will land you in a safe area from which to hit your next shot. Set up with the ball back in your stance. If the ball is in the back of the divot, or if the divot is particularly deep, you'll have to set up with the ball further back in your stance. But even if the ball is in the front of the divot, you'll need to set the ball back a little farther than normal. You want to make sure you hit the ball first, with a more downward stroke so it spins more and flies higher. Set your weight more on your forward leg. Again, this will encourage the downward strike you need to dig the ball out. Shorten your backswing slightly. It's important that you hit the ball solidly to get it out of the divot. Remember that your weight is already positioned forward in your stance. By making a shorter swing, you'll be more balanced during your swing and make better contact with the ball. Make a strong full finish. You want to get the ball up out of that divot so you'll have to take more turf than normal. And if you cut your finish short, the ball will come out lower than you want.